My husband for years has driven me crazy because he wont eat Mexican food. He wouldnt specify what about it he didnt like, he just didnt like it. It took me awhile to narrow it down, but I finally found he just didnt like cumin. He associated ALL things remotely southwest or mexican with cumin and therefor wouldnt even try things. I for one LOVE mexican food. I love fajitas and quesidillas, enchiladas and burritos. It made me sad that I could never make anything remotely tasting like these things because he wouldnt eat it. Now that I know its the cumin I find ways to introduce non-cumin versions of my favorites so he will eat them. Almost everyone has a version of salsa chicken. Most people have it as a meal with taco seasoning and sour cream mixed in. My salsa chicken is a base for many meals. Its basically a filling. I have never eaten just salsa chicken for dinner, but I have eaten a lot of it. I always make a BIG batch in my crockpot and freeze it in 2 cup portions. Its really basic and makes a ton. 2. Cook on high 4 hours. *Use a salsa you have eaten and LOVE. Your chicken is going to taste like it. Dont just but the cheap stuff or something on sale. If you love it and its on sale... awesome! Just make sure you like it. and my husband eats them up! 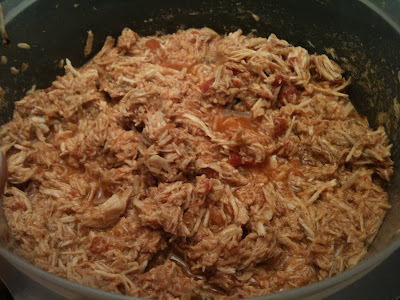 yum thanks for posting....i'm always looking for new chicken salsa ideas! My neice made this when we were visiting and it is now a family favorite at my house. I was just not sure how much salsa to use and hadn't thought of the water to get all the good stuff out. Thanks for the post!